We are on the last day of the Mega blogging Marathon!! I can't believe I actually baked for 26 days straight :D I don't even know how this month flew by, but I do know I've gained a few pounds eating bakes from around the world. And another few pounds from just drooling over all the gorgeous bakes from my fellow bakers! Zopf or Züpfe is a buttery brioche like bread popular in the Switzerland in all of its 26 cantons. Switzerland is very diverse in its culture as well as cuisine. Each canton has its own specialties but the Zopf remains popular throughout. The name Zopf is derived from its shape, and literally means “braid” or “plait”. Traditionally eaten on Sunday mornings, this loaf is next only to the popular Swiss cheese, chocolates and watches. Its shaped differently in various parts of Switzerland but for most part its braided. I found this interesting piece of history here and felt compelled to quote. Read on. "Its origins are fairly unclear and surrounded by many legends, some gloomy, others cheerful. Apparently, in ancient times, women used to accompany their deceased husbands into the tomb and the spirit world in order for the married couple to be reunited in death. Thankfully that dark tradition was abandoned and replaced by a new, less barbarian one. Instead of being forced to perish with her man, the widow only had to cut off her hair (usually a plait) and lay it in the grave, alongside the body of her late spouse. How’s that for some fabulous history huh? :D Now onto the bread. Its light, soft and buttery with a glossy crust. Warm the milk. Add the sugar and yeast, let stand for 10 minutes until frothy. In the bowl of a stand mixer, add the flour salt and butter. Add the yeast mix and combine on low speed. Switch to a dough hook and knead until the dough comes together into a ball and is silky and smooth. Transfer to a lightly oiled bowl and cover. Allow to rise in a warm place for 1-1.5 hours. Punch the dough and let it rest for 10 minutes. 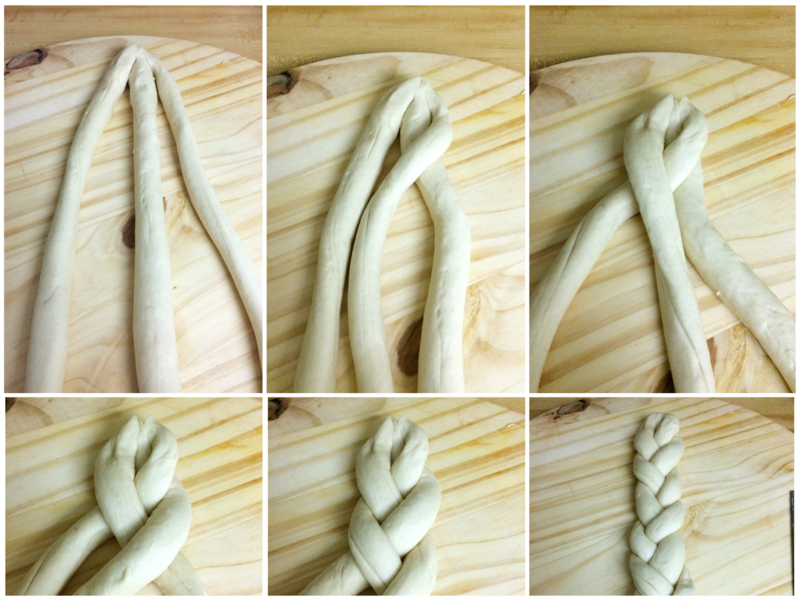 Divide the dough into 3 and roll each piece into a long rope. Braid as shown below. Place on a baking sheet lined with parchment paper. Cover and allow to double in size, about 30-45 minutes. Preheat oven to 350F. Brush the top of the loaf with the egg wash, taking care to cover evenly. Bake in the pre-heated oven for 40 minutes until golden brown and sounds hollow when tapped underneath. That is an awesome braid Namratha! Loved all your bakes for this whole month...and I have gained a few pounds drooling over them. Kudos to you! Kudos girl!..awesome bread with beautiful braiding and a lovely texture. you have rocked with all your bakes and it has been such a pleasure to relish these bakes. Such a gorgeous Zopf, and those braids are just prefect. Seriously your bread looks more beautiful than the store bought ones. Beautiful looking braided bread! !Awesome marathon choices!! This was my first choice for the letter Z but ended up making something else. Your Zopf look stunning -- awesome job!! Oh wow this was my initial choice as well..had to give in for easier option..yours has turned out so good!..can't wait to try my hand. Enjoyed your run so much and needless to say my bookmark has increased! Oh my the braided bread looks so soft inside and hot this beautiful crust. Wonderful show stopper. I am yet to try a braided bread. Should try it out soon. The braids have come out so perfect.. Lovely share..